Press Release – LAS VEGAS (Jan. 29, 2014) — Technological advancement in agriculture is re-defining how, where and when food is grown. Harnessing innovation within aeroponics, unmanned aerial vehicles (UAVs), automated nutrient systems, new tracking technology and carefully engineered indoor environments, agriculture can now be grown year-round with no soil and limited water in the harshest climates on earth. This technological revolution in agriculture is explored at the second annual Indoor Agriculture Conference May 14 – 15 at the Las Vegas Springs Preserve Desert Living Center, where global industry experts convene to discuss advancements in this rapidly evolving industry. Co-hosted by Newbean Capital and the Black Emerald Group, and sponsored by Hort Americas, the conference highlights the accelerating greenhouse, container and vertical farming trend that is sweeping urban centers and inclement environments around the world. Today, indoor agriculture is disrupting the old paradigm of farming as an industry, requiring large tracts of land irrigated by millions of gallons of water and producing fruits and vegetables trucked halfway around the world. 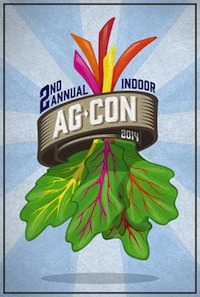 Indoor agriculture is a viable and thriving industry; the North American greenhouse vegetable sector grew sixfold in hectares under glass between 2002 and 2011, according to Farm Credit Canada. And what is capturing the imagination of farmers, technologists, investors, restaurateurs and grocers is the industry’s vast potential as technology improvements render cheaper equipment and horticultural research creates more produce variety and better yields. Restaurants and supermarkets in the arid Western United States, the Middle East and other large urban areas are already seeing the potential for large-scale indoor agriculture to deliver a steady stream of fresh, local produce to produce aisles and restaurant kitchens. Harnessing technology such as hydroponics and aeroponics, indoor agriculture can also conserve land, water, energy and distribution costs. When compared with the expense and uncertainty of outdoor agriculture, which can be disrupted by weather or supply chain breakdowns, indoor agriculture becomes even more appealing for its reliability. Growing indoors also promises higher levels of food safety, as fresher produce grown using few to no pesticides is transported shorter distances, thereby reducing the threat of contamination during production or distribution. This growing interest in the industry was reflected last year at the first annual Indoor Agriculture Conference, which sold out and drew attendees from around the world. This year’s event is expanded from a single-day event to a two-day conference, and prominently features technology, more education sessions, more exhibits and room for additional attendees. Keynote addresses focus on the state of the hydroponics industry and panels discuss the future of indoor agriculture, the types and sizes of operations, technology, sourcing and distribution, regulations/policy, and funding. On the second day, case studies explore in-depth, real-world examples of the logistics of starting, sustaining and growing indoor agriculture operations. Founded in 1994, The Black Emerald Group is a leader in developing specialized financing solutions within the sustainable agriculture, waste management/recycling and renewable energy sectors, and has been involved in more than 50 transactions over the past twenty years. For more information on Black Emerald visit blackemerald.com. Newbean Capital is an investment consulting firm, with a specific interest in agriculture. Its upcoming Las Vegas events include a TEDxManhattan Viewing Party and the second Annual Indoor Agriculture Conference.